Left to right, Frank Mason, Jerry Farris, Frank Lueder and Joe Cruz (in costume) on the tarmac upon their return from Iwakuni in 1958. IF A FEW MORE gray hairs appeared on the "little woman's" head following the return to Barber's Point, Hawaii, of Patrol Squadron 6, it is understandable. 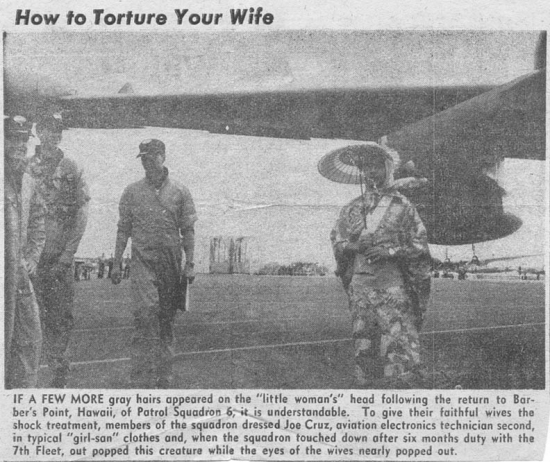 To give their faithful wives the shock treatment, members of the squadron dressed Joe Cruz, aviation electronics technician second, in typical "girl-san" clothes and, when the squadron touched down after six months duty with the 7th Fleet, out popped this creature while the eyes of the wives nearly popped out.